Students can easily learn the primary crystal structures with the samples and activities contained in our complete GEO-logic study set. A teacher's guide and student copymasters are included for the following activities: crystal models, crystal form and habit—measuring crystal faces, and identifying crystal systems. The set is housed in a compartmented collection box. 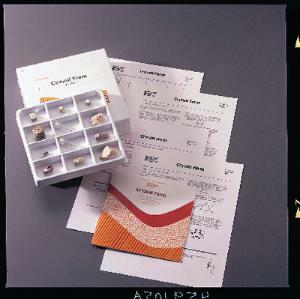 Contents: 12 numbered samples, 1" x 1"; magnifier; protractor; ruler Isometric: grossular, pyrite (2) Hexagonal: apatite, corundum, dolomite Tetragonal: vesuvianite, zircon Orthorhombic: aragonite Monoclinic: orthoclase, staurolite Triclinic: microcline GEO-logic is a unique, comprehensive series of teaching collections designed to assist both teacher and student in understanding basic earth science concepts through hands-on activities and carefully prepared teacher and student guides. The GEO-logic system provides a modular approach to teaching and allows you to address broad curriculum needs for the study of minerals and rocks; natural resources and energy; and fossils and earth history. The two types of GEO-logic teaching collections include: • A Reference Set, which provides an overview of all topics and comes with a teacher’s guide • Activity Sets, which provide greater depth in an individual subject area and include both a teacher’s guide and student copymasters. The GEO-logic system is:• Developed jointly by experienced educators and WARD’S staff geologists• Designed to save valuable planning and preparation time • Created from quality teaching materials for hands-on learning• Classroom tested for dependability. Each GEO-logic collection includes: • Individually numbered specimens chosen for their quality and character • Activity guides with learning objectives and hands-on activities for your students to perform • An attractive, durable compartmented box for easy use and storage.